We’d love your help. 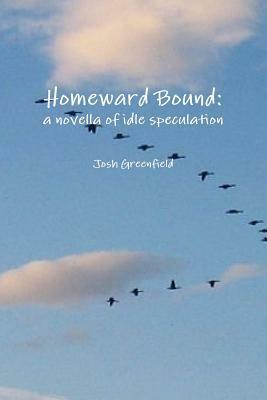 Let us know what’s wrong with this preview of Homeward Bound by Josh Greenfield. A young man sits alone in a public garden contemplating the big questions; the origins of the Palisades Cliffs, cold sesame noodles and his father's mortality. In the spirit of James Joyce, Josh Greenfield, follows the thought process of Jordan Fineman, where ever it leads. To ask other readers questions about Homeward Bound, please sign up. This was an intriguing novella that attempted to put the reader in the shoes of what goes through the mind of someone with a mental illness. Though I understood the methodologies and I appreciated the effect of the point of view, I think this novel could have had done more. If the character had explored more with the discussions with his father or doctor, I think I would have enjoyed, or perhaps understood, the story more. I did enjoy the discussion of the concept “one day at a time” and how tha This was an intriguing novella that attempted to put the reader in the shoes of what goes through the mind of someone with a mental illness. Though I understood the methodologies and I appreciated the effect of the point of view, I think this novel could have had done more. If the character had explored more with the discussions with his father or doctor, I think I would have enjoyed, or perhaps understood, the story more. I did enjoy the discussion of the concept “one day at a time” and how that applied (internally) the main character’s situation. If nothing else, this book did remind me sit back and enjoy a little idle speculation of my own! Please note: I received a free copy of this book in exchange for an honest review courtesy of Sage’s Blog Tours. Who should read it? Folks looking to gain a perspective on the mentally ill or idle speculation.